This is my husband Michael’s favorite Thai dish. Plump shrimp are simmered in a rich and fragrant coconut sauce infused with lemongrass, ginger, hot green chilies and fresh herbs. It sounds exotic but it’s super easy to make. In fact, with just a few essentials in your pantry, you’re never more than 25 minutes away from this delicious meal, alive with the vibrant flavors of Thailand. Serve with jasmine rice, and be sure to put the rice on first so that everything is ready at the same time. Heat the oil in a large skillet over medium-high heat. Add the onions and cook, stirring frequently, until soft, about 3 minutes. If the onions start to brown, reduce the heat to medium. Add the scallions, garlic and green curry paste, and stir-fry for 2 minutes more. Add the coconut milk, water, fish sauce and brown sugar and bring to a gentle boil. Add the shrimp and cook, stirring frequently, until the shrimp are pink and just cooked through, 3-4 minutes. 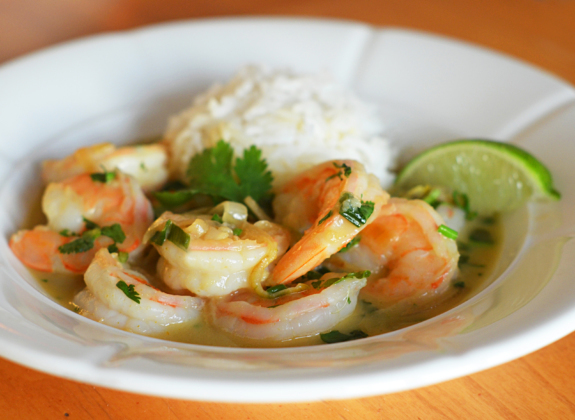 Sprinkle with the cilantro (or basil) and serve with jasmine rice and lime wedges. Note: For the shrimp, I recommend buying frozen shrimp labeled “shell split and deveined.” Most shrimp are cleaned and flash frozen shortly after being caught, so the “fresh” shrimp you see in the seafood case at the supermarket is typically thawed frozen shrimp. Who knows how long it’s been sitting there, so you’re better off buying frozen and defrosting it yourself. Come dinnertime, all you have to do is run it under warm water to defrost, then peel. 0 Response to "Easy Thai Shrimp Curry"